When last seen in connection with University of Idaho football in December, Aaron Duckworth was lighting up Georgia State for 113 yards and a touchdown to finish a 1,025-yard rushing season for the Vandals. He was named to the Sun Belt Conference first team and became the first Idaho player to lead a conference in rushing since Joel Thomas did so in 1996 when the Vandals played in the Big West. For the past week, though, Duckworth has been back in Moscow in a new role with the Vandals. He is a student volunteer assistant coach while he completes classwork for an exercise science degree this fall, and he has an internship in the UI strength and conditioning program next spring. The helmet and pads are gone, and the wardrobe for getting on with life is shorts, a T-shirt and visor. Duckworth this week appears to be a combination of veteran alum visiting practice and student manager, by turns chatting with former teammates on the edges of drills and hustling to corral an armful of red mesh jerseys in preparation for a kick protection and coverage session. It’s an evolving situation, according to Idaho coach Paul Petrino. He says Duckworth will have a role with the running backs and the scout team. The running back aspect, most notably, is interesting for a guy who so recently was one. 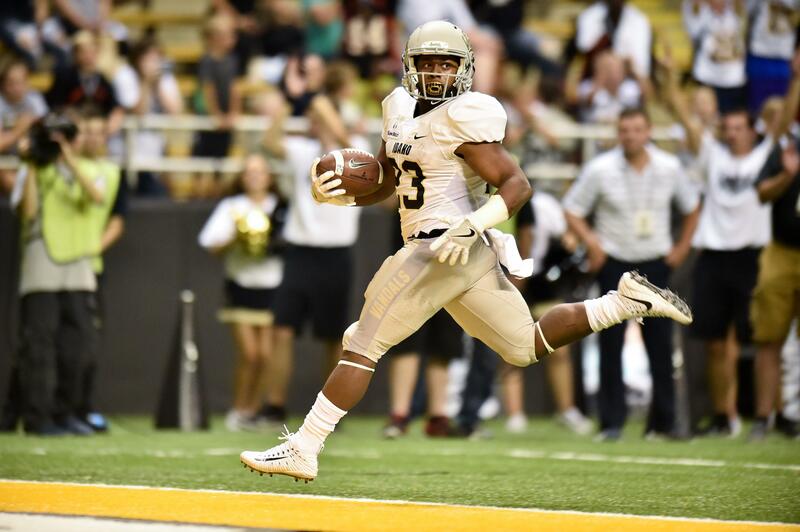 His backfield partner with the Vandals last year, Isaiah Saunders, is a senior now. Petrino says he encouraged Duckworth to remain in school last spring and finish his degree rather than prepare for pro days, but he is philosophical about Duckworth taking a shot at the NFL. Duckworth said he thought about finishing his degree on line, but Petrino encouraged him to return to campus. Now, Petrino is pleased to have Duckworth back at Idaho and associated with the Vandals. Dealing with the trend of football to become like basketball, relying heavily on flow with run-pass option plays, is a coaching emphasis through the remainder of preseason camp, according to Petrino. What it looks like on the field is quickly shifting both offensive and defensive assignments from run to pass or vice versa, as players read appropriate keys. The team is also devoting practice periods to getting ready for specific opponents, he said, and it is refining how it will use two-way players Kaden Elliss, Connor Whitney and Jack Bamis. In the first scrimmage, the defense got the upper hand early without having to do much more than line up and play, it appeared. Not so, says Petrino. “Maybe in the first period.” It was an illusion after that. “Our defense shifts around plenty,” he insisted, particularly in the estimation of a coach with a background in offense who must work against that defense in practice. Published: Aug. 13, 2018, 8:15 p.m.